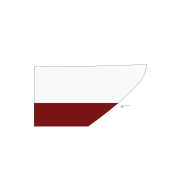 The bow /baʊ/ is the forward part of the hull of a ship or boat, the point that is usually most forward when the vessel is underway. 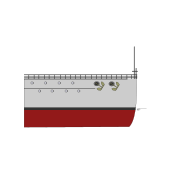 Both of the adjectives fore and forward mean towards the bow. The other end of the boat is the stern. From Middle Dutch boech or Old Norse bógr (shoulder). 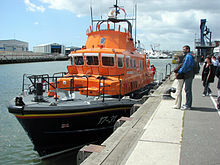 The bow of Severn class lifeboat 17-31 in Poole Harbour, Dorset, England. 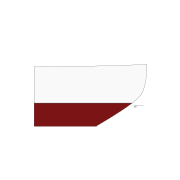 The bow is designed to reduce the resistance of the hull cutting through water and should be tall enough to prevent water from easily washing over the top of it. On slower ships like tankers, a fuller bow shape is used to maximise the volume of the ship for a given length. A "wet bow" results from seawater washing over the top of the hull. A raked stem with flared topsides can help to reduce the wetness of the bow. Aside from making the deck slippery, salt water can corrode the metal of the ship. If the temperature is low enough this water can also freeze on the deck, rails, turrets, and other exposed surfaces, increasing the topside weight. 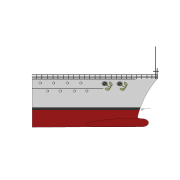 The bow may be reinforced to serve as an ice-breaker, one example being the bow of container-ship Sea Witch whose reinforcement was the cause of significant damage to another ship in a 1973 collision. 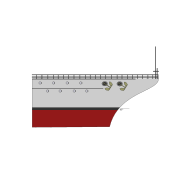 The forward part of the bow, usually on the ship's centreline, is called the stem. Traditionally, the stem was an upright timber or metal bar into which side planks or plates were joined. 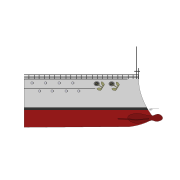 Wikimedia Commons has media related to Bows (ship part). 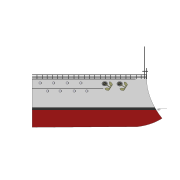 Look up bow in Wiktionary, the free dictionary.